Patrick Rodgers has been Chief Executive Officer since 2000. He serves on the Board of Directors of Euronav and has done since June 2003 and has been a member of the Executive Committee since 2004. Mr Rodgers was appointed Chief Financial Officer of the predecessor of the Company in 1998 Since 2005 Mr Rodgers holds various directorships in companies belonging to the CMB and Euronav group. Mr Rodgers currently serves as a director and chairman of the International Tanker Owners Pollution Federation Fund since 2011. Between 1990 and 1995 when he joined Euronav Mr Rodgers worked as an in-house Lawyer, then executive and Board member at various Shipping and Offshore businesses including Exmar, CMB, and Offshore then an executive board member. 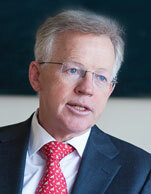 Mr Rodgers began his career in 1982 as a trainee lawyer with Keene Marsland & Co. In 1984 he joined Bentley, Stokes & Lowless as a qualified lawyer and in between 1986 and 1990 he worked for Johnson, Stokes & Master in Hong Kong as a solicitor. Mr Rodgers graduated in law from the University College London in 1981 and from the College of Law, Guildford in 1982.